NAHA, OKINAWA PREF. - Okinawan voters gave Gov. Takeshi Onaga high marks Sunday night in a prefectural assembly election widely viewed as a midterm report on his administration and policies related to U.S. military bases. With the anti-base governor now firmly in control of the assembly, Okinawa’s stance on the controversial replacement facility for U.S. Marine Corps Air Base Futenma is expected to harden — much to the chagrin of the central government. Calls are also likely grow for revisions to the Status of Forces Agreement (SOFA) that would give local governments more autonomy and authority over U.S. military personnel accused of crimes. Onaga supporters now have 27 of the prefectural assembly’s 48 seats, slightly increasing their majority. A total of 31 assembly members — a nearly two-thirds majority — are opposed to construction of a replacement facility at Henoko, on the northern part of the main island, for Futenma, which sits in a densely populated neighborhood in the city of Ginowan in central Okinawa. Voter turnout was 53.31 percent, up 0.82 point from the previous election in 2012. 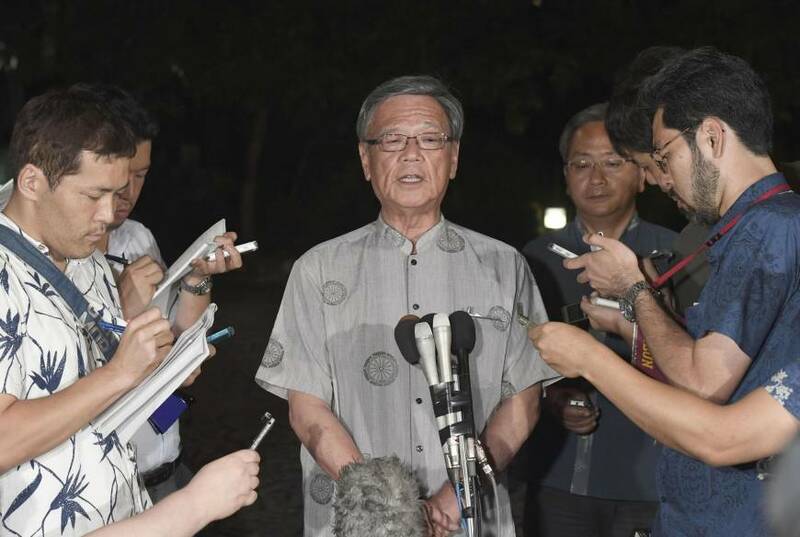 “The election showed that the people of Okinawa support efforts to stop the construction of a new base,” Onaga said at a press briefing early Monday. If Sunday was a victory for Onaga, a former Liberal Democratic Party politician who cobbled together a diverse coalition of traditional anti-base activists and disgruntled local LDP supporters to win the gubernatorial election in 2014, it was a setback for Prime Minister Shinzo Abe and the ruling LDP. The party’s local chapter won 14 prefectural assembly seats and heads into next month’s Upper House election worried about the political fate of Aiko Shimajiri, an LDP Upper House member and the minister in charge of Okinawa affairs. Much will depend on how Shimajiri and local LDP members respond to Sunday’s results — and possibly how they deal with a large rally planned for June 19 to protest what Okinawans have called the unfair burden of hosting so many U.S. bases in the prefecture. 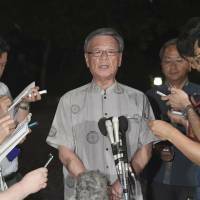 On Monday, top Abe administration officials blamed the LDP’s poor showing Sunday on a number of factors and said there would be no change in the plan to build the Henoko facility. Asked if a spate of incidents involving U.S. forces on the island affected the election, Chief Cabinet Secretary Yoshihide Suga only said that local economic issues played a key role. Traveling in Myanmar, Defense Minister Gen Nakatani said the Futenma relocation must be accomplished as soon as possible. Onaga’s supporters, however, argue that remains a pipe dream for practical and legal reasons. While still backing the Henoko plan, the central government and the United States have been quiet on calls from Onaga, as well as members of the LDP’s Okinawa chapter, to revise SOFA. Such demands have grown stronger in the wake of the slaying a few weeks ago of 20-year-old office worker Rina Shimabukuro, allegedly by Kenneth Franklin Shinzato, an American civilian worker at Kadena Air Base on Okinawa. Although the U.S. and Japan have agreed to review the scope of Americans covered by SOFA, which grants virtual extraterritorial rights to U.S. military service members, there’s no sign they are willing to consider a fundamental revision of the pact itself, which has never been officially changed since coming into force in 1960. Meanwhile, attention now turns to the July 10 Upper House election. Shimajiri will be running next month against former Ginowan Mayor Yoichi Iha, who is expected to receive Onaga’s backing. LDP officials in Okinawa admit the race is likely to be tight but hope voters will appreciate that Shimajiri recently declared her support for revising SOFA, even as she strongly supports the Henoko plan.